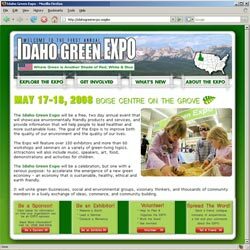 Project Scope: The Idaho Green Expo will is a free, two day annual event that showcasing environmentally friendly products and services, and providing information that will help people to lead healthier and more sustainable lives. The goal of the Expo is to improve both the quality of our environment and the quality of our lives. The Expo will feature over 150 exhibitors and more than 60 workshops and seminars on a variety of green-living topics. Attractions will also include music, speakers, art, food, demonstrations and activities for children. The site was done pro bono as a gift to the people of Idaho. Design Components: New site design consisting of all graphics including the menu, image design and site layout. Several of the pages on the site are driven by database allowing for easier maintenance and administration of the site, including the exhibitors, seminars, speaker, sponsors and volunteers. The site also does live credit card processing of donations for individual sponsorships.